This is an essential book on the 19th-century American Whig party. It explains what the Whig party was; what it stood for; what it did in politics; who its opponents were, how and why it officially died out (but unofficially survived in its similar successor, the Republican Party) and who its prominent members were. Although highly informative, it is obviously biased in favor of the Whigs. It doesn't whitewash them, but has little or nothing critical to say about them. For instance, it maks little or no attempt to explore the downside of their strong belief in "internal improvements" (essentially, using government subsidies to stimulate economic development in ways they liked). 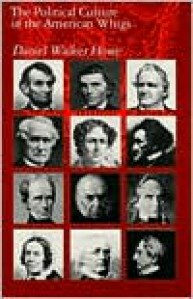 The only time the Whigs really look bad in this book is when it explains why the Whig party fell apart. That was over slavery: the Whig Party opposed slavery, but was willing to compromise on it in order to keep the Union from fracturing; but when the sectional conflicts became too intense to be saved through compromise, the Southern Whigs--many of whom were rich slaveholders--sided with the South and openly expressed white supremacist views. The Northern Whigs were just as resolutely anti-slavery, and the irreconcilable opposition split the party. The Southern Whigs mostly became Democrats, while the Northern Whigs formed the Republican party, whose only substantial policy difference from the Whigs was refusing to compromise on slavery. This book told me what I wanted to know about the Whigs. Now if only I can find a similarly illuminating book about the 19th-century Democrats and their viewpoint.